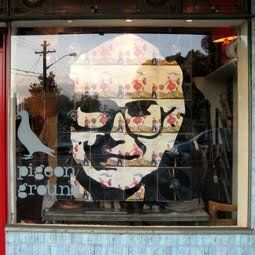 More exciting news: Simply Phoebe creations are now in store for sale at Pigeon Ground Records and Clothing, in Camperdown, Sydney! This shop is pretty much the kind of place Mr D and and I would love to call our own. They stock a mix of old and new vinyl (D's department), new handmade and vintage fashion, accessories, and (in their own words) "curious books, artists' art and other bits and bobs". Perfect. Girls and boys can get lost in there together and easily lose a lazy Saturday afternoon. If you're in Sydney and like the sound of it, I recommend you check it out as a must-visit in the inner west. My connection with Pigeon Ground came through meeting Bri Cheeseman and Andrew Prince, two of the clever and creative people behind the shop. Bri and Andrew are also behind the fashion label Secret Squirrel, a Simply Phoebe favourite for their gorgeously simple and classic collections. PLUS, Andrew also runs Beesides, a music fashion merchandise label. Make that earlier reference: clever, creative and BUSY people! Inspirational stuff. They've not only taken on some of my pieces to sell in the shop, but they have also been a great source of wisdom on getting started in the big wide world of independent and handmade fashion. I'm also talking to a couple of other interesting stockists - stay tuned! In the meantime, I've got lots to do, and probably need to take Bri and Andrew's lead to make it all happen. My new studio space is all set up now and looking pretty great. I'm looking forward to spending some serious time there this week (once I get over a little bug that has had me laid up for the past couple of days, hence extra computer time!). Might even share some snaps with you this week.